Photoshop is a popular desktop application which is used to create and edit images and the world has been using it since its birth with full satisfaction. They say there is nothing in the world of image editing that cannot be achieved using Photoshop. Then came Instagram, a free photo sharing application, which allow its users to click and share images among friends on a number of different social media as well as on its own server by applying some impressive digital filters to the images. Normally one can use this application only with an iPhone, iPad, or a phone running on Android Froyo or higher. So does that mean without such devices you cannot create an Instagramic photo? Why not? As it was said earlier that there is nothing that cannot be done with Photoshop when it comes to photos. So there must be a way to put all those cool Instagram effects to your photos using Photoshop. How could you even doubt that there is no way? Step I: First of all you have to download the ATN file from Here and save it in C:Program Files (x86)AdobeAdobe Photoshop CS3PresetsActions. ATN files contain a set of Photoshop actions. And each action contains a set of steps those are meant to be performed to develop a particular type of image. So in this way we can apply all those steps at once on an image with just one click. And this ATN file you just have downloaded contains all the required actions and hence also the steps to create your favorite Instagramic photos. Step II: Open Photoshop and type Alt + F9 or Click Window >> Actions. You will find a panel open upon the right side. 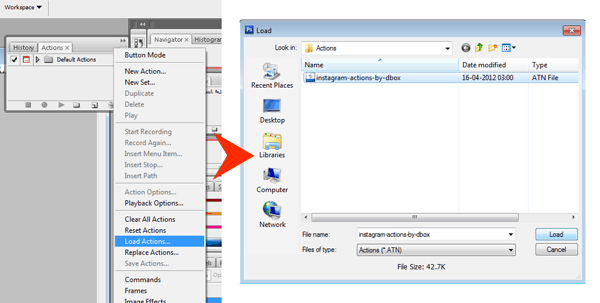 Now click on the down arrow as shown in the image below and click on Load Actions… and then select instagram-actions-by-dbox and then click Load. Step III: Open an image and expand the ATN file to view all the actions. Now select an action and click on the Play Selection button at the bottom as shown in the image below. The effect will be applied and now you can save it in any format you want. 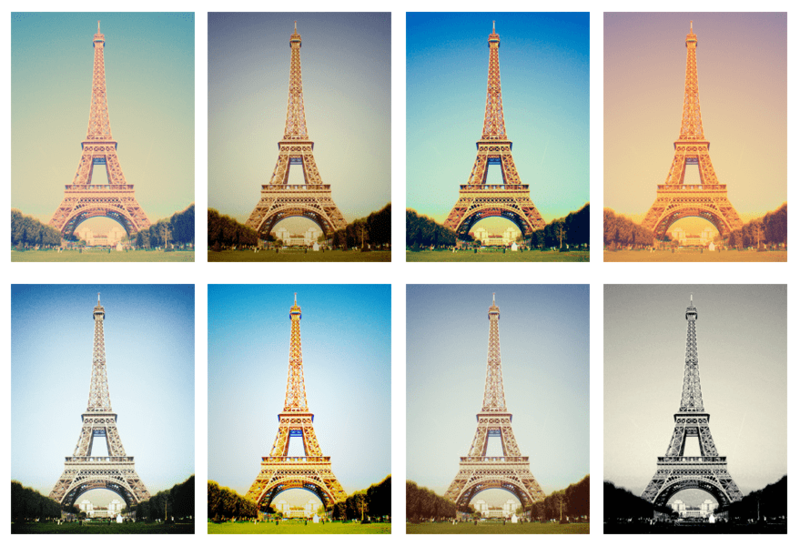 Daniel Box(@dbox), creator of the Photoshop actions managed to develop near Instagramic photos using ojnly Photoshop. Some of the Instagram effects he developed using Photoshop include Early Bird, Gotham, Nashville, X Pro II, Sutro, Lord Kelvin and other filters.